AnitaB.org, the organization behind the annual Grace Hopper Celebration of Women in Computing, has released its second-ever diversity report. As of today, AnitaB.org employs 59 people — 27 white people, seven black people, seven Latinx people, 13 Asian people, 1 Native American person, three people of two or more races and one person with an unspecified race. At the leadership level, AnitaB.org appointed Brenda Darden Wilkerson, a black woman, to serve as its CEO and president. The organization has also made some slight improvements in terms of gender balance, growing from just 4.2 percent male in 2016 to 11 percent male in 2017. Onstage, ABI has a goal of ensuring women of color make up at least 30 percent of the speakers, but did not disclose the exact breakdown for its most recent conference. Since her first day, about nine months ago, that has meant “broadening the tent,” she said. “Making it much bigger and more inclusive, to let women of all backgrounds — socioeconomic, ethnicity, sexual orientation, ability and age,” Wilkerson said. “I think ageism is a huge problem. That broadening of the tent specifically entails focusing on women of color founders, she said, pointing to a recent report that showed black women still receive a ridiculously low amount of venture funding. In total, according to digitalundivided, black women have raised just .0006 percent of all tech venture funding since 2009. Wilkerson also wants to recognize the women in the middle of their careers, who may “hit that ceiling and can’t go further in their organization,” she said. AnitaB.org released its first diversity report in December 2016. At that time, AnitaB.org was 59.5 percent white, 17.5 percent Asian, 9 percent black and 9 percent Latinx. 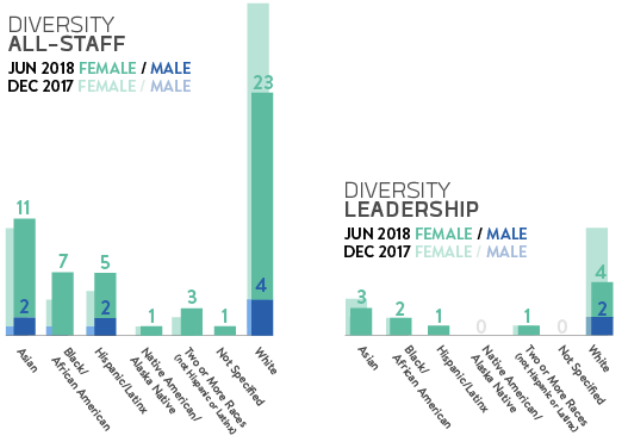 The organization did not disclose diversity at the leadership level, which was notable given that both former and current AnitaB.org employees earlier that year told me there was a lack of people of color in leadership positions. Now, AnitaB.org seems more willing to do the work. And perhaps it helps that the organization has a black woman at the helm.